The PS-100 comes preconfigured for sensitive, high-impedance DC measurements, enabling its use in a wide variety of applications. 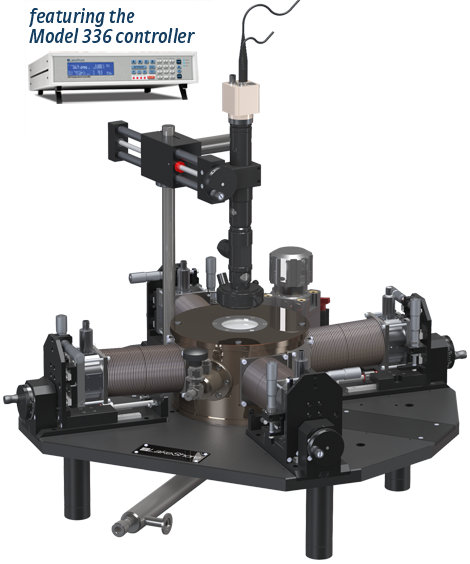 It features a four-arm triaxial TTPX configuration for four-point probing and offers high-stability operation over a temperature range of 4.2 K to 475 K. High-precision, micro-manipulated stages ensure accurate probe tip placement, and the PS-100 accommodates samples up to 32 mm (1.25 in) in diameter. The compact table-top design is perfect for academic and laboratory research settings. It provides efficient cryogenic temperature operation with a continuous refrigeration system using either liquid helium or liquid nitrogen. With the included Lake Shore Model 336 temperature controller, you can regulate sample stage and radiation shield temperatures independently while monitoring probe arm temperature. Plus, the Model PS-100 features complete thermal anchoring and radiation shielding that keeps heat from reaching the sample. Probes are cooled to the sample stage temperature to minimize heat load to the device under test.